For those of you who have enjoyed my ghost stories, The Boy in the Rain and The Haunted House in the Mountains, do I have a deal for you. Being a self-published author, I have been miserably inept at marketing and promoting my book. 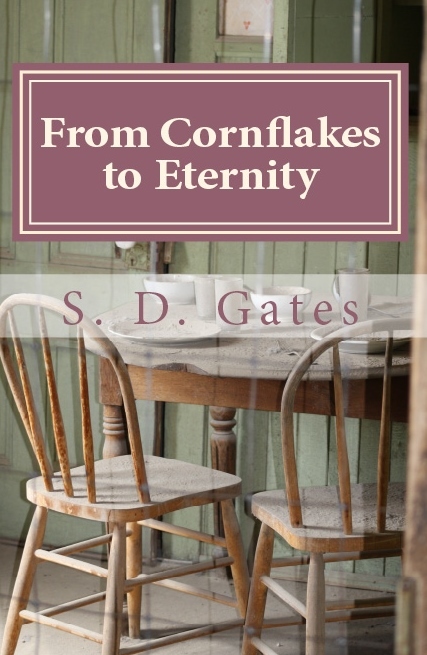 In order to somewhat rectify this situation I am now offering my novel, From Cornflakes to Eternity at no cost to you, to read and enjoy. It is a truly gripping ghost story, with twists and turns that will keep you guessing to the end. Below is a short description of the book. The halls of the Pediatric hospital are quiet now. The ghostly sightings ceased the night the paranormal investigation team was summoned. No one has seen the Little Redheaded Girl, Jose or the Girl in the Pink Boots since the horrific happenings that occurred on the main road leading into the hospital. That was the night the Diablo winds rattled the already parched lands, leaving in its wake a suffocating blanket of sand. The nurses are happy they no longer have to sniff for pockets of sulfurous stench, or be wary of sudden drops in the ambient temperature, but not one of them can make any sense of the events that occurred that night or the days leading up to it. Of course, none of them ever will, because they are not ghosts. Available as part of a free promotion on Amazon. The promotion will begin 18 May 2015 and run through 20 May 2015. Can I download it on Kindle? Yes. It starts on the 18th – maybe it is the 18th where you are. Thank-you so much!!! I hope you enjoy it!!! I didn’t realise you had a book published until you posted this. I managed to download it, once I have read it I’ll put up a review. I tend to be a bit slow with review writing though… At the moment I try to have one review per week, i.e. every Friday. Thank-you so much for doing this and the review when you have time. I really, really appreciate, but most of all I hope you enjoy the book!!!! I do hope so too. I have enjoyed your writing so far, so it should be a good read. Let me know what you think when you have finished the book!!! I’m so excited you are enjoying it!!!!!! I absolutely loved it! I will write a review for sure, if I am good I’ll make it for tomorrow or next week on Friday. Yay!!!! I am so glad you enjoyed it. Thank-you so much for reading it!!!!! Thank-you!!!! I am starting my second one this summer. I am very excited about it! Cool. I’ve downloaded it and will leave a review. Nice cover! How exciting!!! Thank-you for doing that. I hope you enjoy it!! I am a Cheerios person myself, but cereal is good anytime of the day or night. hello. I read the haunted house in the mountains and the boy in the rain and would enjoy reading more of your writings. Are they all in your blog or do you have a different address or site you devote to your art? Here are a couple of my albums you might enjoy, collaborations inspired by stories that I found on the internet. We have a 4th one we’re going to release this Halloween, it’s called the Fog and it’s pretty creepy. We are always looking for more stories as inspirations for collaborations as we both enjoy doing these sorts of projects so if you have any stories that are your favorite I’m open to ideas. Thanks for listening and I’ll be interested in your thoughts on the albums when you have time to check them out. I did it! My review just went out! I hope that it will be read by my readers and that they’ll be tempted to read your book. Thank-you so much. I am so deliriously appreciative. If I can ever return the favor – please let me know!!!!!! I nominated you for two awards tonight. You can accept or not to participate but I hope you do. Rules are on my post. Hope you have a good night. That Is so exciting!!!! Thank-you so much!!!!! Maniacal Ruminations or the "About Page"
A Gazillion Gold Stars for My Dad!!!! !